What does this picture look like to you? Someone who had a big night out the night before? Someone with an allergic reaction? Someone with Bell’s Palsy? No. 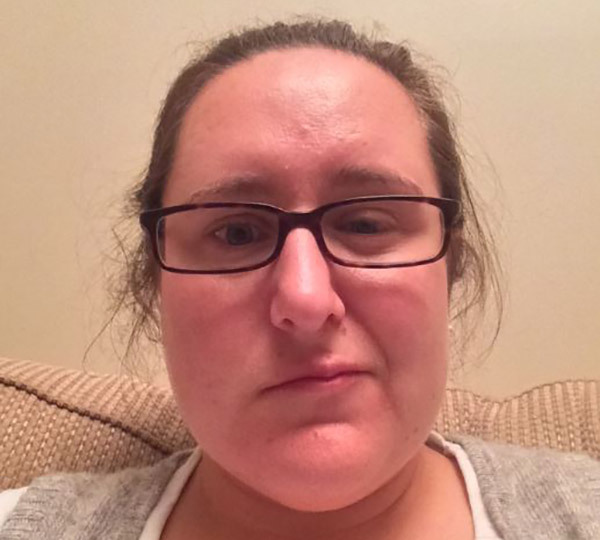 This is a picture of someone with Multiple Sclerosis – MS – having a relapse. This is a picture of me. After my super MCH nurse identified that something was wrong, I went to a series of doctors in quick succession, and ended up in the Neurology ward at the Austin Hospital about 10 days later, receiving intravenous steroids to clear up the relapse – which had not only affected my vision and facial muscles, but also my ambulation and balance. MS is an autoimmune disease that affects the brain and central nervous system (CNS). The brain and CNS is made up of billions of nerve fibres – called neurons. Think of a neuron as a piece of electrical cable – copper wires on the inside, covered with a plastic coating. The copper wire is an analogy for the nerve itself, where all the electrical impulses from around the body travel, telling the body what to do, how to react etc. 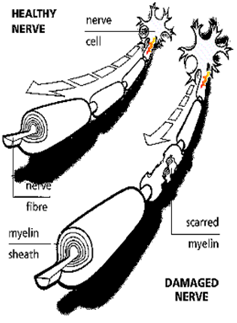 The plastic coating is an analogy for the muscular coating of the nerve fibre – called the myelin sheath. The myelin sheath protects the nerve, allowing the electrical impulses to accurately deliver the messages around the body from the brain. In MS, certain immune cells (a group of white blood cells called B cells) don’t behave as they’re meant to. In the case of MS, it’s thought that they’re triggered by an unknown agent (likely the virus that causes glandular fever) to start misbehaving and nibble away at the myelin sheath covering the nerve fibres. When this happens, it’s called a ‘lesion’. Today, people with MS are diagnosed via an MRI. Upon diagnosis, most people have two or three lesions identified in their first MRI. I had more than 20 – which, to me, instantly meant that I had had MS bubbling away for a long time. Probably since I had glandular fever in 1996. **** DON’T GET SCARED IF YOU HAVE HAD GLANDULAR FEVER**** It’s a really common infection, and MS is thought to develop in conjunction with a glandular fever infection and other factors – including genetics and environmental factors such as Vitamin D exposure. Symptoms I had upon diagnosis included optic neuritis (an inflammation in my left eye), a droopy right face, an inability to see certain colours, and an inability to perform tandem gait (what we called ‘fairy steps’ as kids – walking one foot immediately in front of the other). My visual problems resolved pretty easily but my balance isn’t fantastic an I am still unable to perform tandem gait – I call it my ‘party trick’. I see it as extremely providential that, two years after my diagnosis, I was lucky enough to be appointed as the Course Administrator for National Pilates Training. It’s absolutely not a requirement to let employers know of your MS condition, but, as I was receiving weekly student-run Pilates sessions as part of my job, I let Katrina know. Katrina is not only Founder and Principal Instructor at Aligned for Life Pilates, but also the Founder and Director of Training at National Pilates Training. One morning about 2 weeks into my new job, I took a deep breath and announced to Katrina that I had MS, as she (and others at the studio) would be seeing my body working a lot differently to ‘normal’ bodies. Straightaway she hugged me, and thanked me for letting her know. WOW! I now get weekly student-run Pilates sessions, and I always announce to the students that it’s in their interest to work with me, as part of their coursework involves developing programs for clients with special conditions. Like it or lump it, that’s me… And these weekly sessions have kept my core strong, and enabled my body to work as well as it can, even when I’ve faced relapses which have negatively affected my balance, gait and ambulation. I really think the relapses may have been worse if my core muscles weren’t as developed as they were, thanks to regular Pilates sessions. I find Pilates sessions challenging at times, particularly when I move up and down in a vertical plane. A way I’ve found to minimise these challenges is to shut my eyes when moving in that way – I figure that if one less sense is in play, then my balance sense improves, reducing my vertigo sensations and allowing me to complete the repertoire as best I can. It works for me – that’s the best way I can explain it! At the same time, I’m amazed at my abilities to perform some progressive Matwork repertoire on boxes – I didn’t think my balance would allow me to move off the floor much at all, but it’s a real joy to be able to perform some things I absolutely didn’t think I could – this is someone who normally can’t walk down a flight of stairs without assistance anymore. Again, WOW! I do have a walking stick now, and I’m using it more and more in crowds, as I find that a large number of people around me causes my balance to go awry. But, if I’m to have a stick, it’s a purple and silver stick with polka-dots – fancy! I am now an Ambassador for MS Ltd – the national peak body for people living with MS. I socialise to members of the public about what it means to live with MS in Australia in 2018 and beyond. National Pilates Training is celebrating International Pilates Day on Saturday 5 May, and this year we are partnering with MS Ltd. We are hosting a ‘Pilates for MS’ seminar, where Aligned for Life Pilates staff and clients, and speakers from MS Ltd (including myself in my Ambassador capacity) will help attendees learn more about the background of MS and other neurological conditions, as well as Pilates repertoire to assist clients with these conditions. Attending this seminar costs participants a gold coin donation to MS Ltd.